As a food, a plant thought to originate from India produces a variety of cuisines. Starting from a variety of small snacks, porridge, until the compote. But besides it's a tasty and delicious, green beans and sprout has many health benefits. 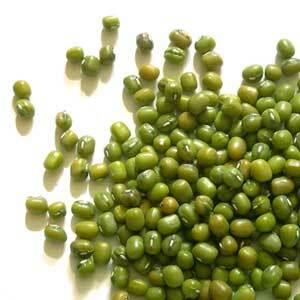 Green beans, or Phaseolus aureus comes from the Family Leguminoseae aka legumes. Protein content is high enough and a source of essential minerals, among others, calcium and phosphorus that our bodies need. While the fat content is unsaturated fatty acid, thus safe for consumption by people who have problems of overweight. Green beans contain high protein, as much as 24%. In the menu of everyday society, nuts are the best alternative source of vegetable protein. Traditionally, pregnant mothers are often advised to consume green beans for infants born has bushy hair. The growth of body cells including hair cells requires good nutrition, especially protein, and because the green beans are rich in protein, the desire to have a thick-haired baby will be realized. The content of calcium and phosphorus in green beans beneficial for strengthening bones. For growth. Initially known as vitamin B1 anti beri-beri. Furthermore proved that vitamin B1 is also beneficial to assist the process of growth. Vitamin B1 deficiency can disrupt the digestive process of food and then be bad for growth. By increasing the intake of foods that contain lots of vitamins B1, such as green beans, grow barriers can be repaired. Increased appetite and improves digestive tract. Indirectly this role is related to the effects of improved body growth. The study revealed that vitamin B1 deficiency causes gastric and intestinal emptying time two times slower to indicate the difficulty of the process of digestion that occur so it is likely that food can not be absorbed properly. Vitamin B1 is part of a coenzyme that plays an important role in the oxidation of carbohydrates to convert into energy. Without the presence of vitamin B1 body will have difficulty in break down carbohydrates. The first signs of a lack of vitamin B1 is the reduction of the nerve. Disrupted neural activity due to oxidation of carbohydrates inhibited. Research on a group of people who lack sufficient food containing vitamin B1 in a short time the symptoms appear irritable, unable to concentrate, and less vibrant. This is similar to the signs of stress. One theory suggests that vitamin B2 may help the absorption of protein in the body. The presence of vitamin B2 will increase the utilization of protein so that absorption becomes more efficient. Antioxidants contained in it can help slow the aging process and prevent the spread of cancer cells. The content of vitamin E it helps increase fertility. Very good to keep the acidity of the stomach and facilitate digestion. because it is alkaline (base). For beauty, which helps rejuvenate and soften skin, remove black stains on the face, acne cure, nourish hair and body slimming.